3D printing continues to forge ahead via thousands of innovators around the globe. Affecting nearly every industry possible, today we see a wide range of hardware, software, and materials being used as the technology continues to hit the mainstream with its own multibillion-dollar economy. 3D printing with metal is certainly one of the processes at the forefront today. And while users on many different levels are interested in using metal for 3D printing, its importance is usually weighed in terms of industrial use as it allows for parts to be made quickly and affordably—and often with inimitable strength. While numerous companies today have become heavily invested in research that centers around studying metal powders (like titanium, steel, nickel, cobalt, and more), others have veered off to find other ways to use 3D printing in metal; for example, Draper’s research and development lab in Cambridge, Massachusetts has created a method for sprayable electronics that could change not only the way products are made and connect to the Internet—but also allows for even greater strides in prototyping. While rapid prototyping has always been one of the main uses for 3D printing, Draper is taking the process a step further with the speed in which electronics can be created through the new sprayable method. The new 3D printer uses ink that is not only ‘multi-material,’ but also possesses conductive qualities that can be used for making circuit boards and other electronics. Such processes have begun replacing subtractive manufacturing due to speed in workflow and greater savings on the bottom line, as well as offering the ability to create parts not previously possible. Lewis goes on to point out that aerosol jet printing (AJP) can be used on structures made of different materials like plastic, ceramic, and metal. This means that electrical components like an antennae or sensors can be printed quickly and in high volume, and allow for integration with an underlying industrial component. As a result, the team found that the conductive ink was not only durable, but able to continue functioning despite extreme environments. This points to greater longevity for electronics, as well as the potential for creating devices that are smaller. “Without a doubt, AJP technology results in electronic systems fabrication with much greater versatility. Among all of our findings, we were most surprised to find that the 3D multi-material printer reduced the concept-to-prototype fabrication time for a microprocessor from many weeks and even months to just a few days,” said White. This is just one project Draper is involved in, as they continue to research and develop new ways that 3D printing can be applied to 3D printing. So far, they have used their new AJP technology to create an antenna and a patent-pending hybrid 3D-microelectronics process. 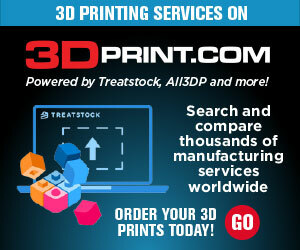 What do you think of this recent 3D printing news? Let us know your thoughts! Please join the discussion of this and other 3D printing topics at 3DPrintBoard.com, or share your comments below.